Studies associate the Mediterranean diet rich in omega-3 fatty acids, monounsaturated fatty acids such as that found in olive oil, and antioxidant-rich fruits, vegetables, and herbs with lowered cardiovascular risk and increased life span. Other studies support omega-3's importance in cardiovascular health. 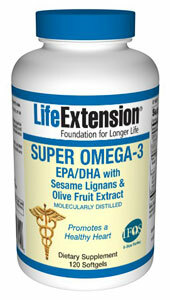 Life Extension's Super Omega-3 is a premium, scientifically-validated fish oil concentrate, derived from sustainable sources, that contains a proprietary, full-spectrum blend of synergistic nutrients to provide scientifically validated cardioprotective health benefits. Super Omega-3 from Life Extension uses a proprietary EPA/DHA technology that results in a pure, stable and easy to tolerate fish oil extract. The Pure fish oil used in Super Omega-3 is produced with a proprietary technology that purifies the oil with a highly advanced distillation process to reduce environmental pollutants to extremely low levels. The result is an improved fish oil that exceeds the standards set by international rating agencies. To emulate a Mediterranean diet, Super Omega-3 provides a standardized olive fruit extract to deliver the polyphenol hydroxytyrosol, a powerful antioxidant that protects normal LDL from oxidation and counters dangerous free radicals.52-55 Research shows that a combination of olive oil and fish oil supplements helps with inflammation better than a placebo or fish oil alone.56 Therefore, four softgels of Super Omega-3 provide the equivalent polyphenol content of 6 tablespoons of extra virgin olive oil. DIRECTIONS: Take two softgels twice daily with meals, or as recommended by a healthcare practitioner.